Wow, life is changing fast! And there's so much for moms and girls to talk about. But how do girls ask the questions they need answers to, and what words can moms use to answer those questions? Here's the solution! This kit includes twin books, one for girls and one for moms, filled with dozens of how-to-say-it scripts to get the conversations going. These scripts give girls the words to talk about all the big topics from body basics, hygiene, and healthy habits to friends, first-love crushes, clothing, and more. And mom's book gives her the actual words to respond to her girl's questions, as well as scripts to initiate important conversations with her daughter. Plus, a sharing journal lets both moms and girls jot down everything from jokes, memories, and must-remember moments to thoughts, questions, and even to-dos. Two bookmarks are included to guide each other to the latest entry or point out something they don't want the other to miss. 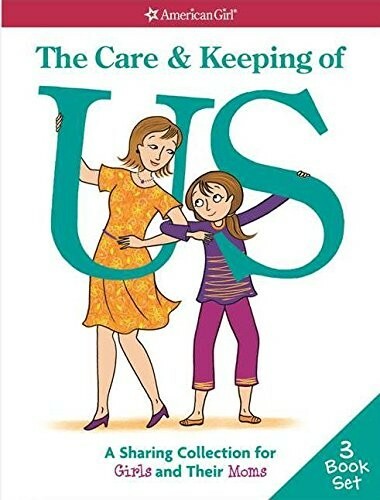 Kit includes: The Care & Keeping of Us: A How-To-Say-It Book for Girls; The Care & Keeping of Us: A How-To-Say-It Book for Moms; and The Care & Keeping of Us: A Book for Girls and Their Moms to Share.